Hello Everyone: We missed you all especially at Thanksgiving this year. That is such a great holiday to celebrate – giving thanks to God for all that He’s given us. We had fun explaining it to our friends here – everyone seemed surprised that we don’t give gifts at Thanksgiving, but that it’s a time for feasting with our families and loved ones. 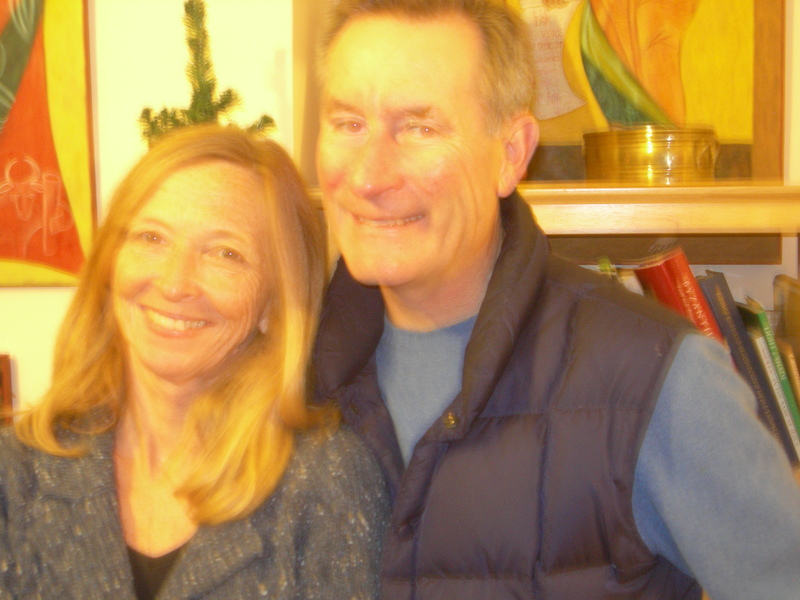 Poking out of my head in this recent rare photo of the two of us together is our tiny Christmas tree. It sits on our mantle and is just the right size for us this year. We have some sad news – our sweet little Dylan dog died on Dec 1 of a hereditary disease. She was the sweetest and most beautiful dog and we are missing her greatly. I believe that I’ll see her in heaven. May not be perfect Theology, but it works for me! Thanks to all of you who prayed for our first “House of Prayer and Creativity” meeting on December 10. Our house was filled to capacity with some really wonderful people who are committed to praying on a regular basis. We will be following a Celtic model of keeping more of a rhythm of prayer rather than a 24-7 prayer watch. That means we have Morning, Noon, Evening and Night Prayer – simple liturgies which all can follow when they can. We have a prayer focus for Bristol, the Nation, and more personal concerns as well. We have a blessing sheet, too, which speaks out blessing to artists and families in our area. If any of you would like to see more, I can email those to you as an attachment. The blessings are a wonderful way of speaking forth God’s best for us and proclaiming His goodness in every situation. Our next meeting is Fri, Jan 21, also here at our house. Our house is becoming a House of Prayer – Yay! But we are praying for a bigger space to house the House of Prayer as well as for another couple to be core members with us. 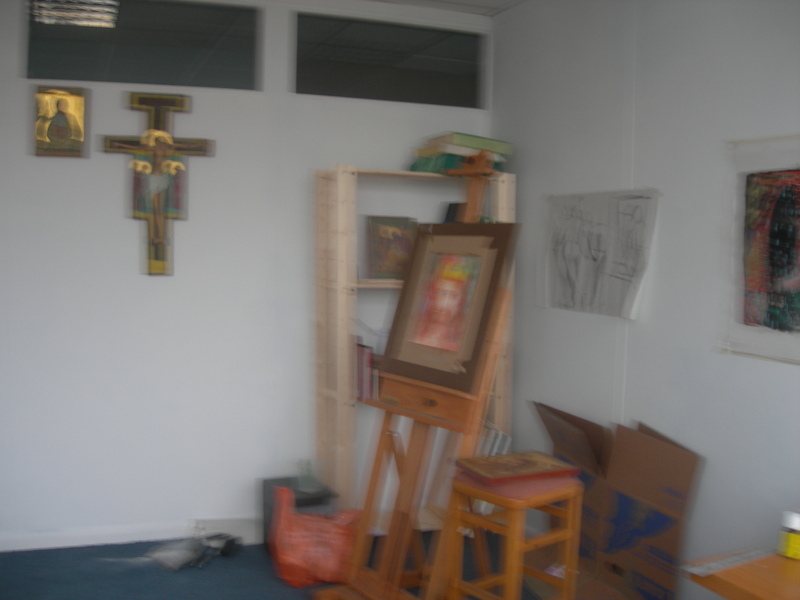 To the right is a snap of my new painting studio at Paintworks – an art community of creatives who work in several buildings very near where we live. There’s no heat – so it’s been very cold, but I love it there. It’s becoming a special place of prayer and creativity for me. I’m still teaching watercolor classes and will start looking into teaching iconography this spring. 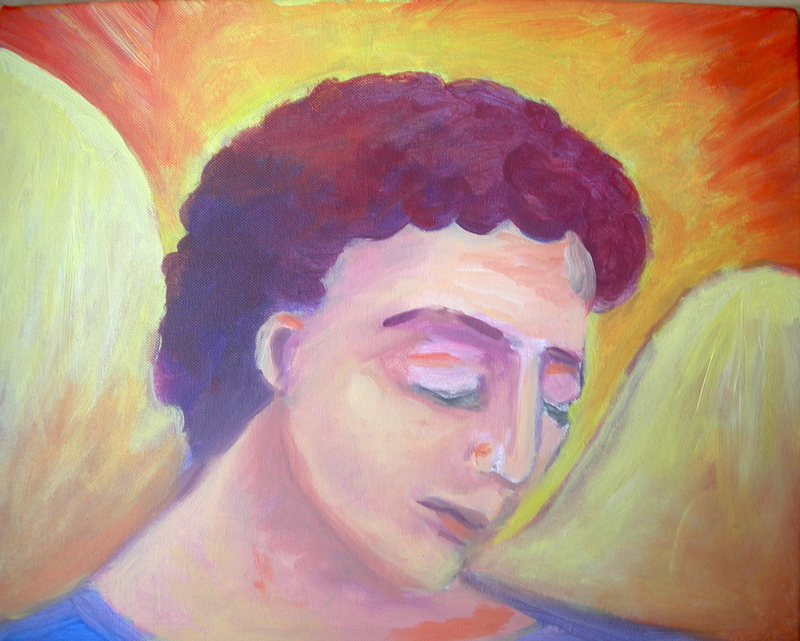 This is the “Angel of Repentance” which God showed me to paint last week at Church. God told me to release this angel in Bristol and in the UK, and that it is an honor to be considered worthy to receive this angel because it is so beautiful in His sight. Here is a picture of Christine painting at Bristol Interfaith Festival, which was a festival of many different religions which are represented in Bristol. For me, Michael, this has been a very interesting experience returning to live in my own country after being away for 29 years. I have to say that it has not been an easy transition so far and we knew from before coming to live here that it would be difficult. However, perhaps what is the hardest aspect of being in England is seeing how much this country needs a revival. There are many wonderful works of God going on here and there are some wonderful churches but the country as a whole appears to be moving further away from a God fearing nation at a rapid rate. There seems to be a spirit of numbness over the country, it is as though we need to shout Awake, Awake even in the Christian community. We strongly believe there is a revival coming to this nation and we can see God positioning people in various different ways and we believe Bristol is going to be one of the break out ports of the Holy Spirit. So the vision God has placed on my heart is to create a website which has three main elements. This vision was for Bristol but it could be for any city or region. Its purpose is to create a prayer covering, a notice board of all that is going on in the body of Christ by date in the city and then to proactively equip, train people in the churches to video what God is doing and quickly post it for the city to see. The three elements are separate but also interwoven. The prayer covering is a timetable where people make a spiritual commitment to pray, The Notice Board is by date so one can see for each day what Christians are doing each day. The video forum is the testimony page where what God is doing does not get lost but is established and raises the faith of the community. I believe one of the most important parts we can play to bring a revival into being is to have the different parts of the church body working together As One. This often means getting the church leaders of a city to work together purposefully. So please keep this vision in your prayers as I approach different leaders in this city to become proactive in this vision. 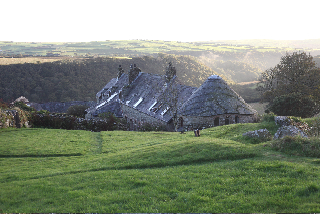 The photograph above is of Ffald-y-Brenin a House of Prayer in Pembrokshire, Wales and the sky picture is from there. It is known as a thin place and God’s presence is strongly felt there. 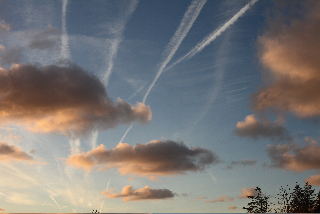 The picture of the sky is above Ffald-y-Brenin and there are many vapor trails from planes heading West from England to America. We live in such an incredible world that we can physically fly from one place to another by plane and we also live in a spiritual world where we can travel in the spirit. Our cries go out for these two countries England and America to travel in the Holy Spirit out of the wilderness we so often see around us.